Jax Malcolm is awarded the #SuperHealer Award from Heal the Bay, and Heal the Bay’s Santa Monica Pier Aquarium. Jax Malcolm is awarded the Environmental Rejuvenation: Demonstration of Leadership Award from Round Table Youth Global and Next TV for his work with CHLA and Heal the Bay. Actor/ Philanthropist and CHLA Jr. Ambassador Jax Malcolm hosts his 1st Annual Children's Hospital Los Angeles #ActionJax Movie Morning at the Vista Theatre on October 8, 2016. This star-studded Halloween themed event included a costume contest, and screening of Casper. Hosted by Jax Malcolm, along with Guest DJ Lela Brown from Radio Disney's "Really Good Time with Lela B" and special Guest Judge Zach Callison the voice of Stephen Universe on Cartoon Network. More than $1,300 was raised for CHLA. Santa Monica, CA (June 7, 2016) – Ocean protection group Heal the Bay is giving new meaning to the phrase “Lights. Cameras. Action!” The Santa Monica-based nonprofit today announced the formation of a Hollywood Ambassador Board, part of its ongoing efforts to spread environmental education and advocacy to new audiences. Ambassadors will work alongside Heal the Bay staff to increase awareness and action to protect the coastal waters and wetlands of Southern California. Current programs include Beach and Community Cleanups, the Santa Monica Pier Aquarium, the Beach Report Card, Citizen Science, and a Water Literacy Speakers Bureau. Actresses and longtime Heal the Bay board members Julia Louis-Dreyfus, Amy Smart and Sharon Lawrence welcomed the following new supporters from the entertainment industry: Ali Larter and Hayes MacArthur (Angie Tribeca), Mark-Paul and Catriona Gosselaar, Sean Murray (NCIS), Brian Dietzen (NCIS), Dan Bucatinsky (Scandal), Ashley Rickards (MTV’s Awkward), Beau Mirchoff (MTV’s Awkward), Normani Kordei (Fifth Harmony), Camille Grammer (Real Housewives of Beverly Hills), Troy Garity (HBO’s Ballers), Dawn Olivieri (House of Lies), and Colman Domingo (Fear The Walking Dead). The new Ambassador board also includes a number of young talent eager to get involved with the cause from an early age, such as Isaak Presley (Disney’s Stuck in the Middle), Jax Malcolm (Crazy Ex-Girlfriend), and Chloe Noelle (Host, San Diego Fox5 Kids Korner). The Ambassadors have already been getting their feet wet by participating in Heal the Bay’s annual Nick Gabaldon Day, which celebrates diversity at the beach and L.A.’s first surfer of color by welcoming inland youth for free surf lessons. A number of Ambassadors will also be attending Heal the Bay’s annual Bring Back the Beach Gala on the sand at The Jonathan Beach Club this Thursday, June 9. For more information on Heal the Bay, please visit www.healthebay.org. HEAL THE BAY is an environmental nonprofit based in Santa Monica dedicated to making the coastal waters and watersheds of Greater Los Angeles safe, healthy and clean. We do this work for the millions of people who visit the Bay each year, as well as the thousands of animal species that call it home. Our vision is to leave sustainable shorelines and thriving inland watersheds for generations to come. Using passionate advocacy, we fight for improved water quality throughout our region. Employing sound science, we protect the animals that inhabit Santa Monica Bay and its surrounding watersheds. Mobilizing communities, we organize 25,000 volunteers each year to clean local beaches and neighborhoods. Deploying hands-on marine education, we inspire 100,000 youth annually to become future stewards of the environment. On May 6, 2016 actor, philanthropist and CHLA Jr. Ambassador Jax Malcolm had the honor of speaking at the VIP reception at the Los Angeles Zoo at global Dream Night where more than 1,000 patients and family members from Children’s Hospital Los Angeles (CHLA) will enjoyed a respite from their healthcare worries during this special evening at the Los Angeles Zoo. Jax himself raised over $1,200 to help make Dream Night a success for the patients and their families. 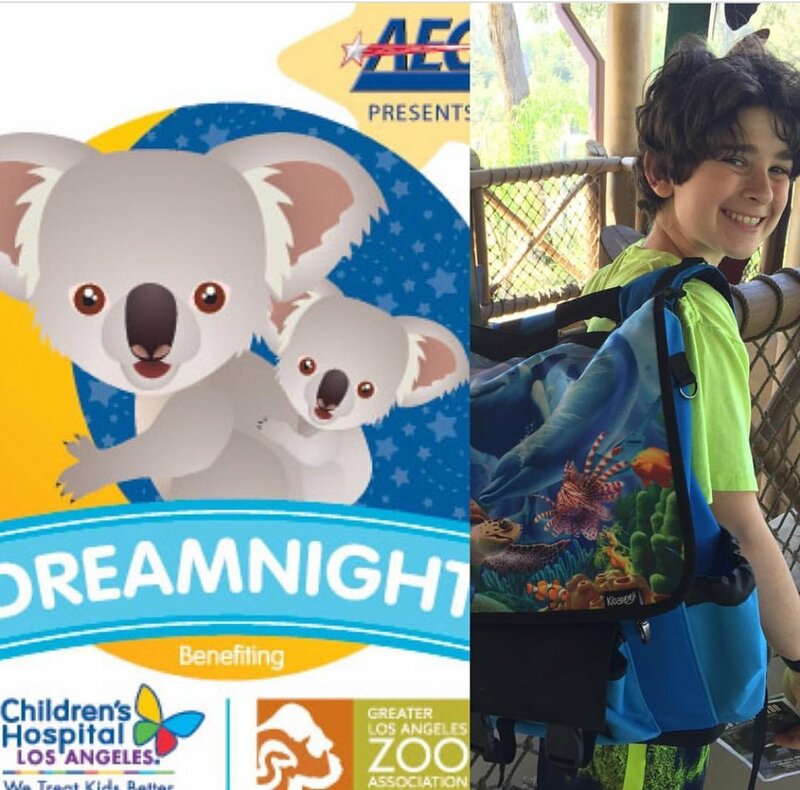 AEGmade a generous contribution as the presenting sponsor of Dreamnight. Additional sponsorship support was given by Honest Company, Wayne Gretzky Foundation, and EPSON, plus other generous sponsors..
Everyone can support the work of both the Greater Los Angeles Zoo Association and CHLA by joining a global community devoted to supporting children who have experienced significant illness or injury and the institutions who have cared for them. Donations can be made here.